Israeli soldiers attacked, Wednesday, a nonviolent procession against the escalating Israeli violations against the Palestinians and their lands in al-Baq’a Meadow, south of Tubas, in northeastern West Bank, wounding at least fifteen, and abducted two Palestinians, including a journalist. The protesters marched carrying Palestinian flags, and chanting against the ongoing Israeli occupation, and escalating violations. 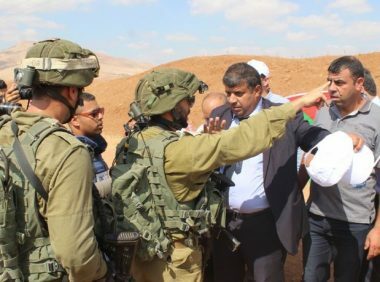 The WAFA Palestinian News Agency has reported that the deputy governor of Tubas, Ahmad al-As’ad, and four other Palestinians, had to be moved to hospitals for further treatment, after the soldiers assaulted them. It added that the soldiers also abducted, ‘Ala Badarna, a cameraman working for a German news agency, and Husam Abdul-Razeq. The procession was attended by international peace activists, and dozens of Palestinians, including representatives of various factions, nongovernmental organizations and owners of lands that became isolated, or was confiscated, by Israeli to build illegal colonies and the Annexation Wall. The head of the Palestinian Committee against the Annexation Wall and Colonies, Waleed ‘Assaf, said that Israel is ethnically cleansing the Palestinians from the area, especially by the illegal annexation of their lands and the construction of its colonies. He added that the Palestinians in the West Bank meadows are largely denied access to what is left of their lands, but will continue to resist Israel’s illegal and racist policies aiming at forcing them out of their lands and the entire area. On his part, Tubas deputy Governor Ahmad al-As’ad, said that the Palestinians will not give up, and will never abandon their lands and legitimate rights despite Israel’s excessive use of force and illegal policies.